In a recently published scientific paper, endometriosis is described as a “perplexing disorder.” There are thought to be roughly 176 million women and girls of reproductive age around the world that would probably agree with that description. Even though so many girls and women experience the painful disorder, little is understood about it. What is known is that it occurs only during reproductive years, when a woman experiences a menstrual cycle. It affects women in their 30s and 40s most often but women younger and older can develop it, too. Endometriosis is characterized by lesions of uterine tissue that grow outside of the uterus. As menstruation occurs and uterine tissue is shed, the stray uterine tissue undergoes the same hormone-induced changes although it cannot be shed through the vaginal canal. Symptoms of endometriosis include cyclic pain throughout the abdominal and pelvic areas, irregular bleeding, ovarian cysts, chronic pain, and infertility. Medical science frequently turns to animal studies to learn more about biological conditions and processes experienced by humans. Primates and other mammals, including mice, are frequently used due to their close physiological resemblance to humans. For various reasons, it is not feasible to use nonhuman primates (chimps, monkeys, and the like) for study of endometriosis so mice would seem like a reasonable alternative. There’s only problem with that idea, though: mice don’t menstruate. If there is no menstruation, there can be no endometriosis to study. Dr. Erin Greaves, of the MRC University of Edinburgh Centre for Reproductive Health in Scotland, has developed a novel approach to overcoming that barrier. She’s created mice that do menstruate. 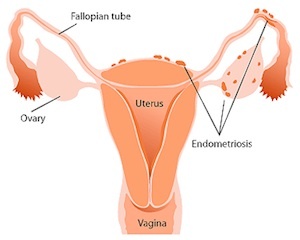 She’s transferred endometrial tissue into their abdominal cavities and it responds to fluctuations of estrogen and progesterone just as it does during a human menstrual cycle. The Greaves research team then introduced specialized immune system cells called macrophages into the transplanted mouse endometrial tissue. Macrophages attack and ingest foreign threats to the body. The macrophages Greaves used were treated to become fluorescent (visible) under microscopic examination. The macrophages in the endometrial tissue transplanted into wild (non-menstruating) mice survived the transplant and created a microenvironment that promotes painful inflammation and encourages development of lesions that become endometrial tissue. Greaves expressed excitement at discovery of the macrophages and their role in lesion development. This process had never been witnessed in previous research using mice to study endometriosis. With further use of Greaves’ menstruating mice, there is the expectation that a deeper understanding of human endometriosis will be possible. This kind of new knowledge may even prove beneficial in creating new and improved treatment options. Source: Greaves, Erin, et al. “A Novel Mouse Model of Endometriosis Mimics Human Phenotype and Reveals Insights into the Inflammatory Contribution of Shed Endometrium.” The American Journal of Pathology. Elsevier Inc. Jun 9, 2014. Web. Jun 26, 2014.